Can’t help it. I adore risotto. Every gluttonous mouth watering bite is comforting to my soul. There is just something so remarkably satisfying and sensual about the creamy rice texture once it has lapped up all that glorious stock and Parmesan has been delicately melted and laced throughout. We have the Italians to thank for most gastronomic delights (yes, of course the French get loads of props too). If you’ve never indulged in risotto, I beg you to allow this sensational dish to pass your lips. Last night was my lucky night. I have been craving this gorgeous yet simple dish since the last time we slipped it into our mouths. A few weeks ago we were getting tired of grubbing on all the same old Christmas time foods so I slipped in this pasta to mix things up. (Yes, I know I’m just wild like that!) Not your traditional holiday meal, but seriously, everyone adored it and there wasn’t a speck left. But since I’m continuing on the master cleanse for 4 more days, this tasty Italian delight will just have to wait. Find out more about my master cleanse journey here. This recipe turns out the best if you stick to the instructions precisely. Adding the milk and cream mixture every 15/20 minutes and allowing the sauce to simmer for the full hour and a half is key. In a medium saucepan over medium-high heat, cook the bacon until it is crisp and has released almost all of its fat, about 6 minutes. This is called rendering. Add the onion, carrots, celery, salt, and pepper and cook, stirring frequently, until the vegetables are very soft and lightly browned around the edges, about 6 minutes. Add the ground chuck and cook, stirring to break up any clumps, until the meat is browned, about 5 minutes. Add the vinegar, garlic, and tomato paste and cook for 2 minutes, stirring constantly. Add the beef broth and bring to a boil. Lower the heat so that the sauce just simmers. Simmer, partially covered, for 15 minutes. Combine the milk and cream in a small mixing bowl. After the sauce has simmered for 15 minutes, and at even intervals, start adding the milk-cream mixture little by little–1/4 cup or so at a time over 11/2 hours. By the end of the 11/2 hours, the milk mixture should be completely incorporated and the sauce should be very thick and creamy. This sauce is not supposed to be very “saucy”– it should be tender morsels of meat coated by a thick, creamy sauce. Transfer the cooked pasta to a large heatproof bowl and add the sauce. 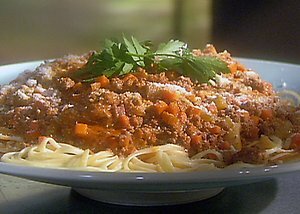 Toss the pasta with the sauce and serve immediately, garnished with grated Parmesan cheese, if desired. Let me know how you like it! Enjoy. I promise, you’ll go back for seconds. A few weeks back we hosted a little fall soirée weekend for our friends and family. We were particularly floored and extremely flattered our buddies from Amsterdam drove all the way to be here with us. The weather was crisp but not too cold with the sun streaming down on the course – perfect for golfing. Along with Fattie’s help, I made a large Italian feast Saturday night for 40 peeps…..
Heat the oil reserved from the tomatoes in a large, heavy frying pan over a medium high flame. Add the sausage and cook until brown, breaking up the meat into bite-size pieces with a fork, about 8 minutes. Transfer the sausage to a bowl. Add the artichokes and garlic to the same skillet, and saute over medium heat until the garlic is tender, about 2 minutes. Add the broth , wine, and sun-dried tomatoes. Boil over medium-high heat, stirring occasionally, until the sauce reduces slightly, about 8 minutes. Meanwhile, bring a large pot of salted water to a boil. Add the penne and cook, stirring often to prevent the pasta from sticking together, until tender but still firm to the bite, about 10 minutes. Drain the pasta (do not rinse). Add the pasta, sausage, and 1/2 cup of the Parmesan cheese, the basil, and the parsley to the artichoke mixture. Toss until the sauce is almost absorbed by the pasta. Stir in the mozzarella, if using. Season to taste with salt and pepper and serve, passing additional Parmesan cheese alongside. The small changes I made were due to the fact that it was a bit challenging to find two of the ingredients readily available here in Sweden. I know, are you kidding me right now? It proved hard to find frozen artichokes, and since canned/jarred artichokes lose their shape when cooked too long, I omitted them altogether. It’s a rare sight to see ‘Italian sausage’ in the grocery store, so I substituted with chorizo sausage. The Easiest Dinner Ever. Seriously. Who doesn’t love an antipasto plate? Sometimes something quick and simple can be intensely satisfying. As most of you are aware and can easily deduce from the definition above, antipasto translated from Italian means, “before the meal” or “before the pasta”. My Italian friends have informed me to be creative and flexible when creating these scrumptious arrays of finger foods. Here are some of the nibbles we included in ours last night: roasted red peppers, large capers, artichoke hearts, sun dried tomatoes, marinated Parmesan cubes, fig jam, Italian salami, Serrano ham, Spanish Manchego cheese, Italian Taleggio cheese, Danish blue cheese, Andouille & Merguez sausages, served with toasted French bread and please, don’t forget the wine. Italian wine would be a perfect choice. We were thrilled to receive these Italian wines as a welcome gift on my arrival to Sweden. The impressive & brilliant, 2003 Tenuta Sant’Antonio Amarone della Valpolicella Selezione Antonio Castagnedi. The reviews list this wine as, nutty, with a dried fruit and clean mineral character on the nose and palate. Full-bodied, with velvety tannins, lots of flavor and a long finish. Nice dusky plumb tones in the glass. Nose of raisins, prunes, cherry, summer berries and vanilla. Very smooth – this wine is 15.5% ABV but this is not readily apparent on the palate. (Deceptively boozy). Plenty of dark sour fruits, chocolate, cinnamon, spice and a good lingering finish of kirsch and plum. Very nice. 5,000 cases made. 91 points. Around $50 USD here.